Prof. Othmar M. Lehner is the Vice Dean for research and a full professor of Entrepreneurial Finance and Risk at the University of Applied Sciences Upper Austria (AACSB member). He is also the director of the ACRN Oxford Research Centre, a long term visiting professorial fellow at the Smith School of Enterprise and the Environment at the University of Oxford, and an academic visitor at the SAID Business School of the University of Oxford. His research interests are social and sustainable entrepreneurship, related venture finance and impact investing. 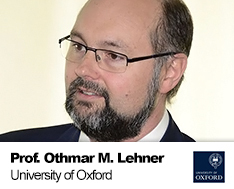 Dr. Lehner is extensively published in his field, and a regular visiting scholar, lecturer and supervisor in Heidelberg, New York, Cambridge, Oxford, Salzburg and London. His latest project is the editorship of the Routledge Handbook of Social and Sustainable Finance, published in July 2016.